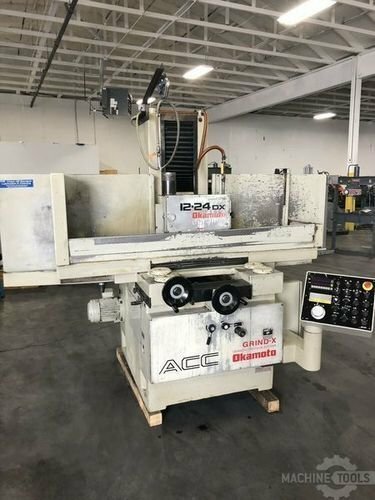 To view more information on the OKAMOTO ACC-12-24DX, including brand information, photos, videos, and more, click here. 2000 Okamoto ACC 12.24DX Machine has been inspected by Okamoto trained technicians and is in good working order with 75% life left on the ways. Ready to be put back into service. Serial # 64704 Specifications: Grinding Length x Width: 24" x 12" Grinding Wheel: 12” Diameter x 1.5” W Spindle Motor: 5hp Fine Line Magnetic Chuck Taken out of service due to lack of work for this machine.